This activity is for the real guys who like to get a proper adrenaline shot! Within 20 minutes driving from the centre a great "playground" is waiting for you. 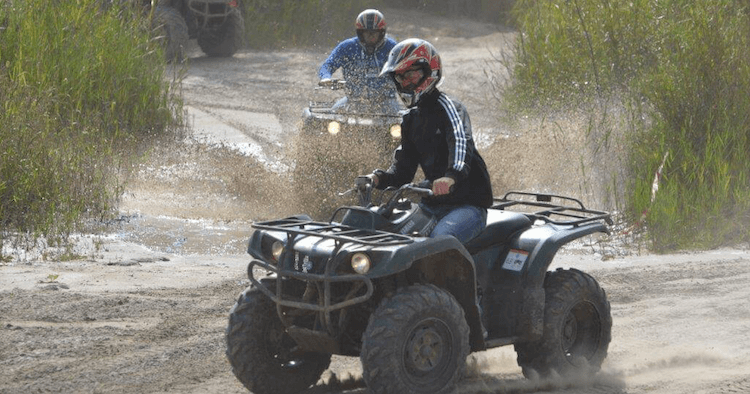 A rural area with sand dunes, hills and off-road terrain is the perfect location for these activities. Time to experience the power and fun of quad driving for 1.5 hour. First you start with a instruction to handle these machines and of course a safety check. When you have sorted the gear and helmet the off road experience will start. You will hit the tracks and practice various diciplines. Per 3 people you will shift the driving so you can have a rest in between.ABout 20 miniutes driving time for each. At the end of this adrenaline shot you will have a break of 30 minutes to talk about your experiences and have a drink. Now it is time fot the BIG adrenaline rush! You will board the 4 x 4 vehicle where you each will steer the wheels and challenge the tracks for a while. Try to complete the tasks in good order and bring your fellow groupmates safely back after 1,5 hour of driving in total. For an additional fee it is also possible to add an extra fun item for the bachelor. The bachelor has to drive an obstacle track with 1 meter of beer on the quad. The better he completes, the more beer you will enjoy so encourage your friend this time! • Price | € *99,- p.p. *Please ask for the price if you are with more or less people. Also possible to book separately.